John Scott Redd. 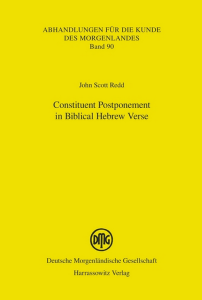 Constituent Postponement in Biblical Hebrew Verse. Abhandlungen für die Kunde des Morgenlandes 90. Wiesbaden: Harrassowitz, 2015. This monograph by John Scott Redd takes the study of constituent order in Biblical Hebrew poetry to a new level of sophistication. The author’s control of the linguistic literature is impressive, but his feel for literary style and effect is not lost in a welter of technicalities. The result is a book to be read with profit not only by biblical scholars, but by classicists, linguists, and literary critics as well. The idea for this monograph dates back to my undergraduate studies in English Literature at The College of William and Mary, and it reached completion in my doctoral dissertation recently defended at The Catholic University of America. During the summer of 1996 I devoted myself to the study of English poetry in the modern mode and became aware, perhaps for the first time, of the idea of poetic structure as a category of study. It was not until my seminary years, however, that I was able to apply that idea to the corpus of verse attested in the Hebrew Bible. The question of what differentiates verse from prose continued to draw me as does the related question of whether verse is, on the one hand, a discrete literary form or, on the other, a point on a spectrum that includes prose in its numerous expressions. I am not persuaded that a description of Biblical Hebrew (BH) verse that generates only and all lines of BH verse has been offered, but I am confident that such a description is a legitimate and worthwhile pursuit. I hope that this present study advances the discussion toward that goal. My work is largely influenced by the work in BH syntax and poetics by Bruce K. Waltke and the late Michael P. O’Connor. In terms of Biblical Hebrew verse, I cannot overstate the significance of the work of O’Connor in that area. I had the privilege of sitting under him as a pupil during my doctoral studies, and those who are familiar with his work will sense his influence on every page of this study. The structure of BH verse remains an open question today despite the extensive amount of investigation that the question has inspired. Much headway has been made in terms of describing the features and devices that find expression in BH verse, but little has been done to make a compelling and consistent distinction between BH verse and BH prose. The question remains: what differentiates BH verse from prose? One distinguishing feature of BH verse can be found in its “relaxed” syntactic structure, wherein certain syntactic constructions that would be unviable in prose are acceptable in verse. One such construction is the occurrence of syntactic constituent postponements that are viable in the environment of verse but not in prose. In the verbal clause, such postponement would include (1) irregular subject- and (2) object-placement in a clause after constituents that they would normally precede in prose, and (3) placement of the verb in the third constituent position of a clause, a position that excludes the verb according to the syntactic rules of prose. As with all phenomena of syntactic relaxation, constituent postponement should be understood as a result of what has been called the “defamiliarizing” effect of the artful language that constitutes BH verse. A close analysis and evaluation of the constituent postponements found only in BH verse are required to develop a more precise description of that corpus. This study gathers all of the cases of verb-, subject- and object-postponement found in a broad sample of BH verse, categorizes the occurrences, and evaluates their relationship to poetic devices such as syntactic, semantic, and phonological parallelism and gapping, and syntactic dependency. This project begins with an assessment of constituent order rules for verbal clauses in BH prose, or more particularly Classical Biblical Hebrew (CBH) prose, which provides a “control” against which postponement in BH verse could be viewed in relief. The sample of BH verse includes Genesis 49, Exodus 15, Numbers 23-24, Deuteronomy 32 and 33, Judges 5, 2 Samuel 1, Psalms 1-25, 78, 106, and 107, Isaiah 40-48, Habakkuk 3, Zephaniah 1-3, Zechariah 9. This corpus is designed to reflect a variety of biblical texts which represent diverse periods, genres, and subjects. Occurrences of constituent postponement were culled from this sample corpus, analyzed, categorized, and evaluated. You can purchase it in ebook format here. Here is the publisher’s page.